If you’re considering buying a house, you may just think you take out a loan from the bank and pay what they tell you to pay monthly. Unfortunately, it’s a bit more complicated than that, and understanding what is included in your monthly payment as well as how much you’ll have to pay monthly can help you make a wise purchase and not buy more house than you can afford. What Is In the Monthly Mortgage Payment? Principal and interest on the loan–The principal is the amount that you borrowed from the bank. Each month, a portion of your payment goes on the principal. As you pay down the principal, you owe less to the bank and own more of your home outright. The interest is what you have to pay the bank for letting you borrow the money. Shop around or use a mortgage broker to help you find the best interest rate. The lower your interest rate, the less you’ll likely pay monthly and the less youll pay over the life of the loan. Even a 1% difference in interest rates can make a huge difference in the amount you have to repay. Property taxes–Homeowners have to pay property taxes. This money is given to the local government to help fund things like the local schools and the local library, for instance, among many other services. Depending on where you live and how expensive your home is, you could pay property taxes that are as low as a few thousand dollars a year to well over $10,000 a year. In the beginning, before you have much equity in your home, the tax payment may be rolled into your monthly mortgage payment. Home insurance–This insurance protects your home and belongings from damage or theft. The home insurance premium payment may be a part of your monthly home loan payment, although some banks let you pay this yourself. You’ll need to check to see what your lender allows. Private mortgage insurance, if necessary–Private mortgage insurance (PMI) is required by lenders when you have less than 20% equity in your home. The best way to avoid PMI is to have a down payment of 20% or greater on your home when you purchase it, but this can be difficult to do in expensive markets. If you have less than 20% down, you will need to pay PMI until you own 20% of your house. PMI protects the lender should you default or a foreclosure become necessary. Once you understand what is included in a monthly mortgage payment, figuring out how much you will owe monthly is easy with the many mortgage loan calculators available online. You’ll need to see what mortgage loan interest rate you qualify for as well as how much your property taxes will likely be. (This information is online with each home listing that you look at.) You’ll also need to call your insurance agent to get an idea how much your home insurance will be. 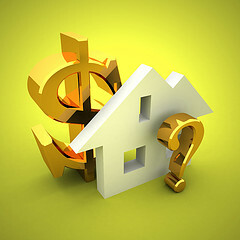 If you will need to pay PMI, you’ll have to ask your lender how much that will be. Then, simply use the calculator to determine your monthly payment. Remember, being prudent when buying a home is best. Don’t overextend yourself; make sure that you can comfortable afford your payment when considering all of the variables. Finally, don’t forget to also leave room to set aside 2 to 4% of the home’s value for future home repairs.